Rescuers were Friday engaged in a difficult operation to pull out an 18-month-old boy who fell into a 60-feet-deep borewell while playing near his house in Balsamand village in Hisar district of Haryana. 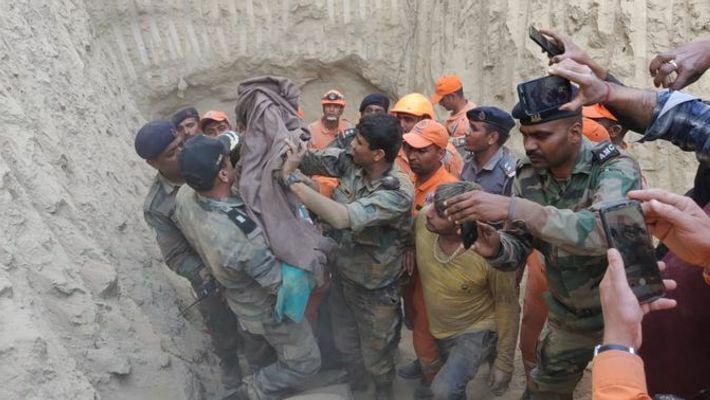 After continuous operation for the last 48 hours, the Army along with National Disaster Response Force (NDRF) and district authorities ‘successfully rescued’ an 18-month-old boy who had fallen into a borewell at Balsamand village of this district on Wednesday. Nadeem Khan was playing in the fields when he slipped into the borehole at about 5 pm on Wednesday. A farmer had dug the borehole about two weeks ago to install a tube well. According to officials, the Indian Army at Hisar Military Station was contacted on March 20 by the administration and police, for help. The Indian Army provided comprehensive humanitarian assistance to the civil administration. "We reacted immediately and sent our reconnaissance party on site. The Army engineers prepared the heavy equipment of dozers and JCB while the civil administration provided excavators and JCB," said a senior army official. The reconnaissance party, on arrival at the site, had highlighted the need for a camera to observe the child's health inside the borewell which was promptly provided by the civil administration. A night-vision camera was dropped in the borehole to keep a constant watch on the child who was fast asleep. The officials had provided oxygen in the borehole. There was no information about the condition of the child since Thursday evening. The rescue team had on Thursday tried to pull the child out with the help of a net. Though the child was trapped in the net, he got stuck after coming out 4-5 feet, and the rescue team had to abort the plan. Two teams of the NDRF from Ghaziabad was called to rescue the kid. Army engineers with the assistance of civilian excavators had already started digging to construct a connecting tunnel 60 feet deep to avoid any harm to the child. Around 30 personnel of the NDRF and an equal number of Army personnel and the local authorities were involved in the operation. The accident has again brought to the fore the dangers posed by open bore wells, which have turned death traps for children. In 2006, a massive operation was launched to rescue five-year-old Prince, who had fallen into a borewell in a village in Kurukshetra. He was pulled out safely nearly 48 hours later. Kerala floods: How is RSS comparable to Muslim Brotherhood, will Rahul Gandhi explain?